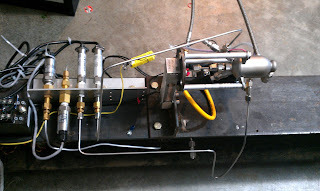 The injector for this chamber is a pintle configuration based upon the design I showed in previous posts. I had a local shop EDM the 8 0.014" injector holes in 1/8" instrument tube and then pinched off the end of the tube. This is a picture taken through a microscope showing the EDM holes. The price was extremely reasonable - drop me a line if you interested having some small hole EDM work done. Hopefully I'll be able to do some limited ignition testing soon.